Decathlon's ski game is strong. And to top it, here are 7 innovations to make skiing that bit more... exciting. I guess we should start by explaining what we mean by ski gear 'innovations'. They're new features, designs, gadgets and mods to anything from skis to goggles. To make buying your ski gear a little easier, whether it's saving money or making the experience out on the mountains a little more comfortable. And we'll assume that if you have children and ski, you'll know the feeling of fear at the idea of seeing who's outgrown what as we approach the ski season. This Wed'ze ski boot is designed for novice to intermediate junior skiers whose feet are still growing. For kids' feet sized 8 to 13.5, these boots conform to the size of the child's foot with an inflatable system that modulates the volume of the liner and covers 4 foot sizes. It's the best compromise between foot support and comfort so that young skiers can totally concentrate on learning to ski without the risk of wearing poor fitting ski boots. 2) The Freeride ski outfit - complete with PlanetSKI's favourite winter item. For both men and women, the freeride jacket and pants (both with down feather removable liners) has beendeveloped for the advanced skier. It looks advanced as well, looking and functioning like the very high-end products and brands. The technical jacket is £219.99. It's waterproof and breathable, warm, durable with freedom of movement, and the down inner jacket is removable. The ski pants are as well designed for back country skiers seeking modular trousers to ski all season. Gaiters enable easy access to the hooks on the top of the boots to optimise the opening of boots with ski/walk function - particularly useful for those who walk or use skins to get to a great slope. Designed for the skier and snowboarder looking for all-weather goggles equipped with an instant lens hue. The ETINT electro photochromic lens of these Wed'ze goggles change in hue automatically so you can see in all types of weather. Designed for skiers from beginner to intermediate levels. These Wed'ze mens groomed slope skis are ideal for use on 90% carving slopes and 10% all types of snow. Intuitive skis, they provide grip allowing you to discover carved turns on groomed slopes. Easy at low speeds and stable when accelerating, they are the perfect ally to improve whilst enjoying yourself. The skis are built through injection, rather than by the traditional sandwich construction. "Dont be put off by the price of these skis. "Because they are manufactured differently from any construction of skis on the market they have a slightly unusual feeling when you set off, but once you start carving turns they will hold an edge even on icy snow. "They are lively and responsive and would be ideal for someone looking to develop their skiing on piste to dynamic carved turns." Adjust the length of their ski trousers thanks to this system (exists for men, women and kids). The Wed'ze design team (all parents of young skiers) developed these ski pants to help children improve their skiing as they grow. 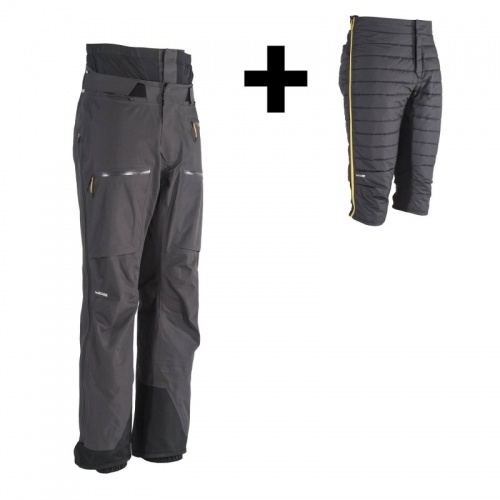 Warm and waterproof trousers equipped with the Pull 'n Fit system for adjusting leg length. You can also adjust these trousers at the waist, using the removable straps. These Wed'ze snowboarding pants have an extra layer so your bottom doesn't get as cold (or wet!). Important as we all know how snowboarders love to sit down. There are also thin knee pads for kneeling. Have you got a bolter? Jokes aside, the kids ski harness is a popular way of teaching little ones.